Mont Saint-Michel is a rocky tidal island 247 acres in size, and is a commune in Normandy, France. It is located approximately one kilometre off the country's north-western coast, at the mouth of the Couesnon River near Avranches. The islands highest point is 92 metres (301 feet) above sea level. The population of the island is 44, as of 2009. The island has held strategic fortifications since ancient times, and since the 8th century AD been the seat of the monastery from which it draws its name. Mont-Saint-Michel and its bay are part of the UNESCO list of World Heritage Sites. More than 3,000,000 people visit it each year. William de Volpiano, the Italian architect who had built the Abbey of Fécamp in Normandy, was chosen as building contractor by Richard II of Normandy in the 11th century. He designed the Romanesque church of the abbey, daringly placing the transept crossing at the top of the mount. Many underground crypts and chapels had to be built to compensate for this weight; these formed the basis for the supportive upward structure that can be seen today. 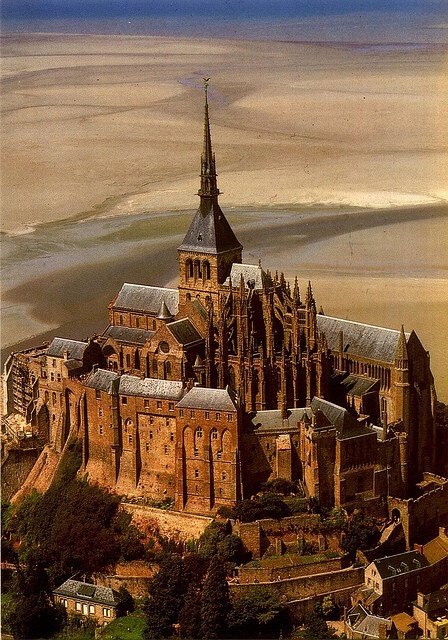 Today Mont-Saint-Michel is seen as a Romanesque style church.